As we wrap up February, here are the top jewel stories of the week! 9. During a visit to the Spanish National Ballet on Monday, Queen Sofia let her spangled jacket take center stage, pairing it with simple gold jewelry. 8. 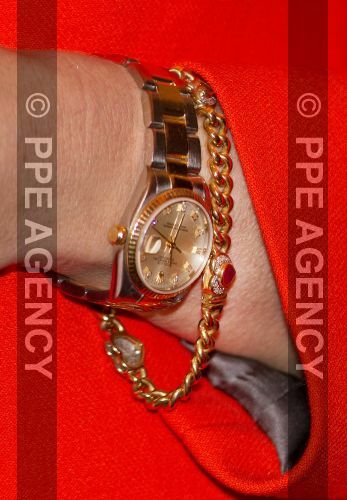 Royal photographers got a close-up view of Queen Mathilde's bracelet and watch during a seminar on cyber-bullying on Thursday -- wonderful to get to see even simple royal jewels so clearly! 7. Courtesy the Luxarazzi blog, here's a rare look at a piece of jewelry that once belonged to the princely family of Liechtenstein: the ruby and diamond tiara of Archduchess Elisabeth of Austria. 6. 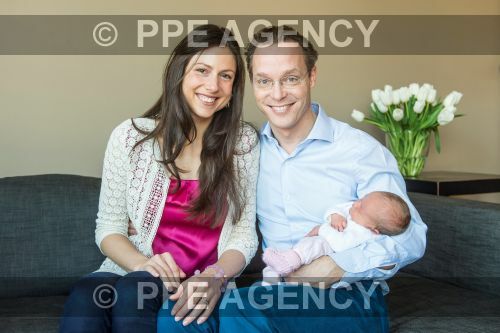 The Bourbon-Parma branch of the Dutch royal family grew a bit this week, with the birth of Princess Zita, the first child of Prince Jaime and Princess Viktoria. As she is a descendant of Queen Juliana, I think we can expect to see this little princess (who was named after her father's great-aunt, the last empress of Austria) wearing pieces from the family's jewel foundation one day. 5. For a rather windy visit to Portsmouth on Wednesday, the Duchess of Cornwall wore her Nelson diamond brooch, which she generally dons at events related to the Royal Navy. 4. 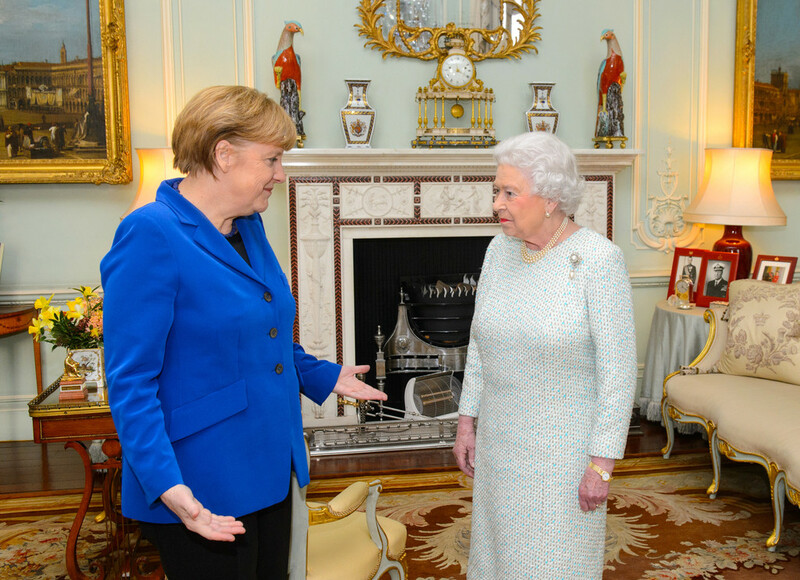 To welcome German Chancellor Angela Merkel to Buckingham Palace on Thursday, Queen Elizabeth II chose a diamond and pearl brooch from the collection of one of her own German ancestors: Princess Augusta of Hesse-Kassel, the wife of Prince Adolphus, Duke of Cambridge (and grandmother of Queen Mary). The Queen inherited the Duchess of Cambridge's brooch from Queen Mary in 1953. 3. 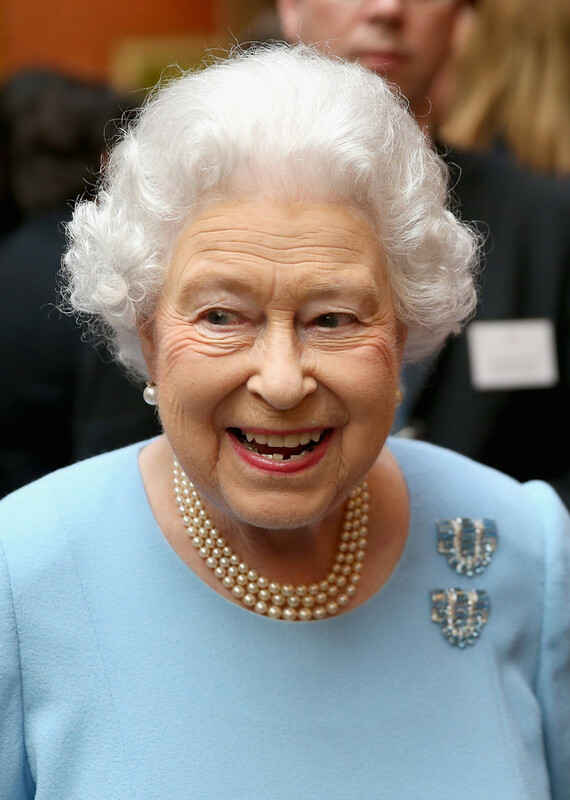 Also on Thursday, the Queen wore her Cartier aquamarine clips for the presentation of the Queen's Anniversary Prizes for Higher and Further Education. The clips were given to her by her parents in 1944 as an eighteenth birthday gift. 2. A poster at the Royal Jewels of the World Message Board has posted a complete inventory of the jewels that belonged to the late Princess Lilian of Sweden, including their assessed value. 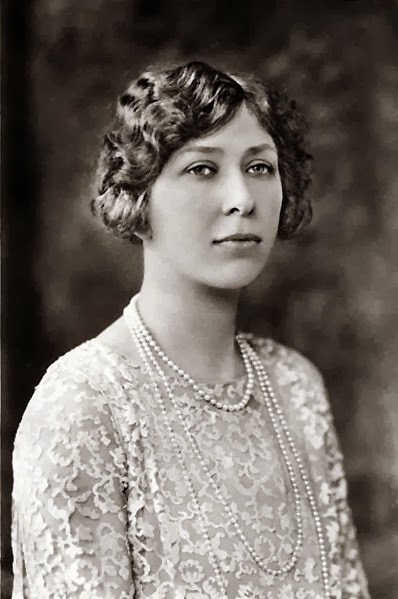 As you may expect, two pieces from the collection of Crown Princess Margareta -- the diamond laurel wreath tiara and the scarab necklace -- were among the most valuable. 1. And finally, this week the Swedish royal family welcomed a new member: Princess Leonore, the newborn daughter of Princess Madeleine. Some were surprised that the baby was given a title, but I, for one, am thrilled -- Queen Estelle is going to need a buddy to help show off the Bernadotte jewel collection in a few years! 1. Banner image: detail of The Marriage of George, Duke of York to Princess Mary of Teck (1894) by Laurits Tuxen. Image in the public domain; source here. February is quickly drawing to a close, but I didn't want to let the month fly away without paying tribute to its royal purple birthstone, the amethyst. Here's a roundup of some of my favorite amethysts in royal and noble collections. (Spoiler alert -- the amethysts above are sadly not included!) Add your picks below in the comments! One of the rare parures in the British royal collection that lacks a tiara, the Kent amethysts originally belonged to Queen Victoria's mother, the Duchess of Kent. The set includes a necklace, earrings, three brooches, and a pair of hair combs. Queen Victoria inherited the demi-parure from her mother, and she bequeathed the set to the crown on her own death in 1901. Elizabeth II wears a single brooch from the set most frequently, but she wore the necklace, one of the brooches, and the earrings on a state visit to Portugal in 1984. Leslie Field notes that the Queen "appears to have no special affection for the stone, as she has worn the Kent suite only twice in public" . 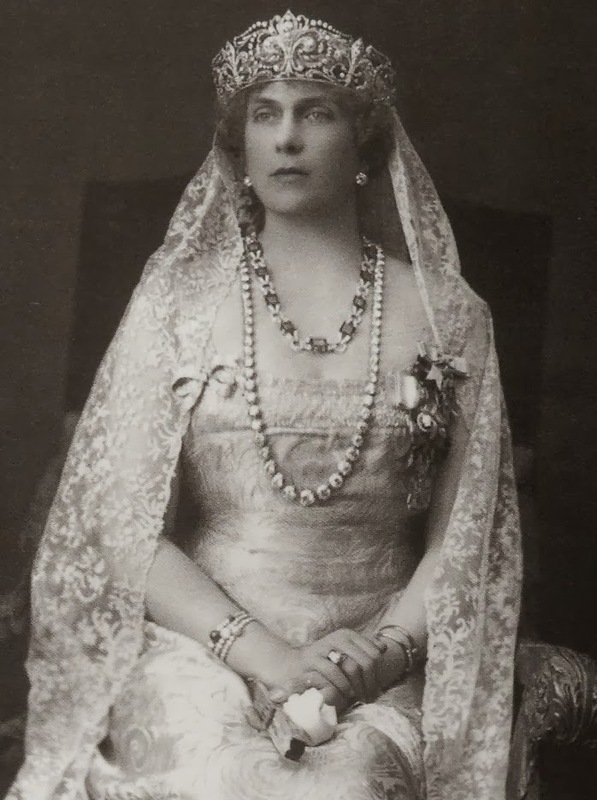 HM also owns another amethyst necklace, a wedding gift from Queen Alexandra to Elizabeth Bowes-Lyon, that she has apparently never worn in public at all. (It was worn at the premiere of Skyfall by the Duchess of Cornwall.) And then there's the famous case of Queen Mary's amethysts, which the Queen refused for the royal collection. 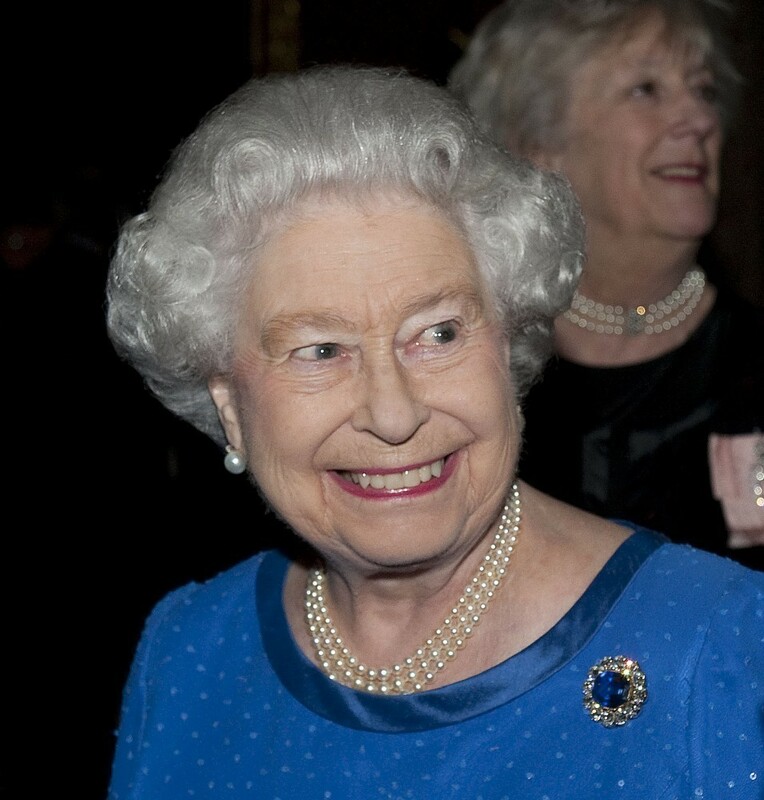 Too bad for those who want to see her wearing more royal purple -- but at least the amethysts that remain in the Windsor vaults have a centuries-old royal provenance. Among the number of impressive parures owned by the Swedish royals is perhaps the best royal amethyst set of all: the Napoleonic amethysts. Given by Empress Joséphine to her daughter-in-law, Augusta of Bavaria, the amethysts came to Sweden with Augusta's daughter, Joséphine. They've remained with the family ever since, and today they are a part of the family's jewel foundation. The set was given a makeover in the 1970s that included transforming a large necklace into a tiara; today, the parure consists of a tiara, a pair of bracelets that can also be worn as a necklace, earrings, and a series of brooches and pins. The lovely, deep-purple stones are worn by all three of the senior Bernadotte ladies -- Silvia, Victoria, and Madeleine -- at various white-tie events. 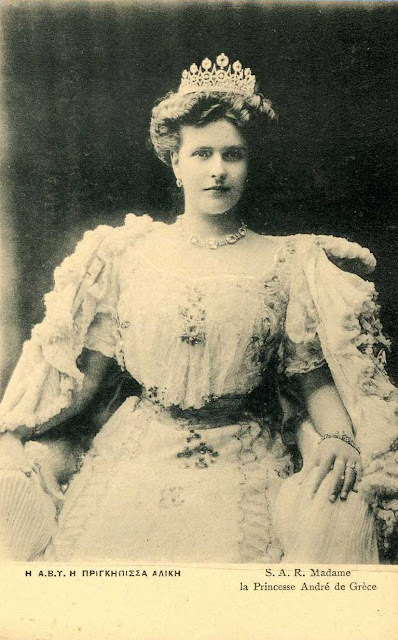 The current queen of the United Kingdom may not be the biggest fan of amethysts, but her great-grandmother, Queen Alexandra, absolutely loved them. 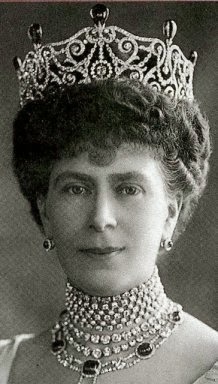 The amethyst tiara she wears at right was given to her by her brother-in-law, Tsar Alexander III of Russia, who was married to Alexandra's sister, Dagmar The tsars had access to one of the best sources of high-quality amethysts in the world: the amethyst mines of Siberia. The tiara featured seven of those large, oval-shaped Siberian amethysts set in diamonds. 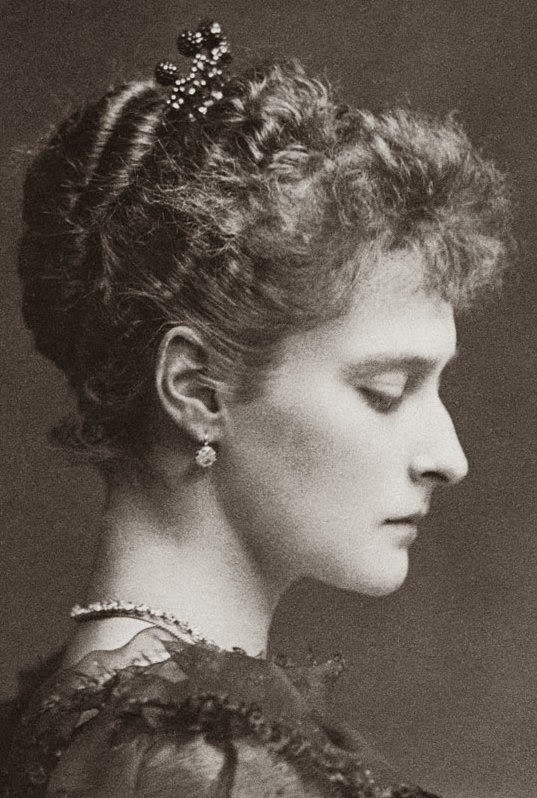 Alexandra later also commissioned an amethyst necklace (which could also be converted into a tiara) to coordinate with the tiara she already owned. Both of the amethyst pieces were inherited by her daughter, Princess Louise, in 1925; they were sold at auction twenty years later. 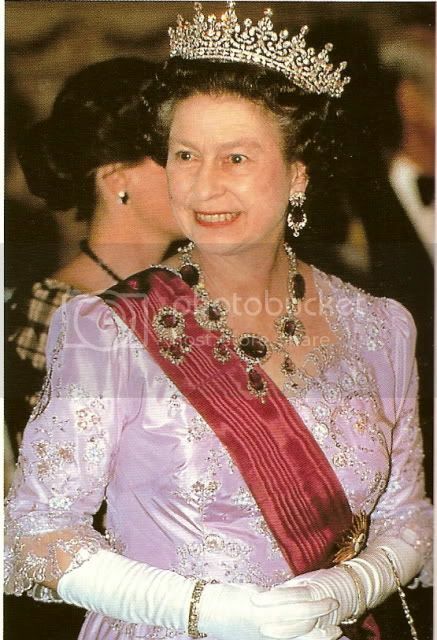 In recent years, Alexandra's amethyst necklace has popped up in public twice: once at the tiara exhibition at the V&A in 2002, and then again in 2007, when it was once again put up for auction . Some of the most gorgeous amethysts of all belong not to a royal family but to a British aristocratic family. 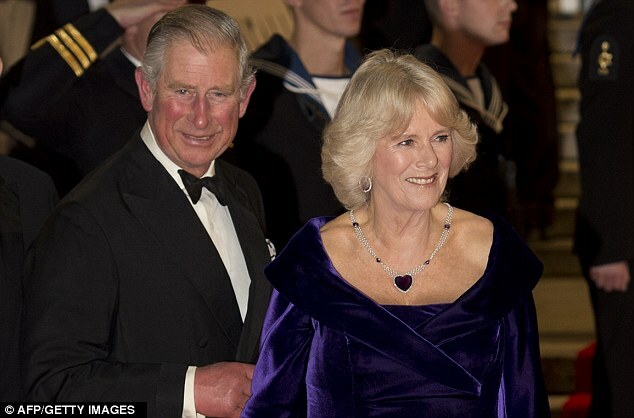 The Russells, who hold the Bedford dukedom, have a necklace and tiara set with beautiful wine-colored amethysts . (The set takes its name from one of the dukedom's subsidiary titles, the Tavistock marquessate.) The grape-colored stones were set around 1870 into a tiara of diamond leaves. The entire effect is delightfully Dionysian — which makes perfect sense, as the word “amethyst” roughly translates to “not intoxicated” in the original Greek. The Greeks believed that those who wore the stone were protected against drunkenness. I don't know about that, but I think anyone who gets to wear amethysts as lovely as these is very lucky indeed! 1. Cropped version of photograph available via Wikimedia Commons; source here. 2. Cropped version of an image in the public domain; source here. 3. See The Queen's Jewels, p. 20. 4. Cropped version of photograph available via Wikimedia Commons; source here. 5. See details from the 2007 auction of the necklace here. "Wedding Gifts Fill Big Hall at Palace"
The spacious picture gallery in Buckingham Palace, which is as large as the grand ballroom of any New York hotel, today presented a dazzling spectacle to a small party of invited guests who viewed a portion of the magnificent wedding presents that have been sent to Princess Mary and Viscount Lascelles, who are to be married next week. 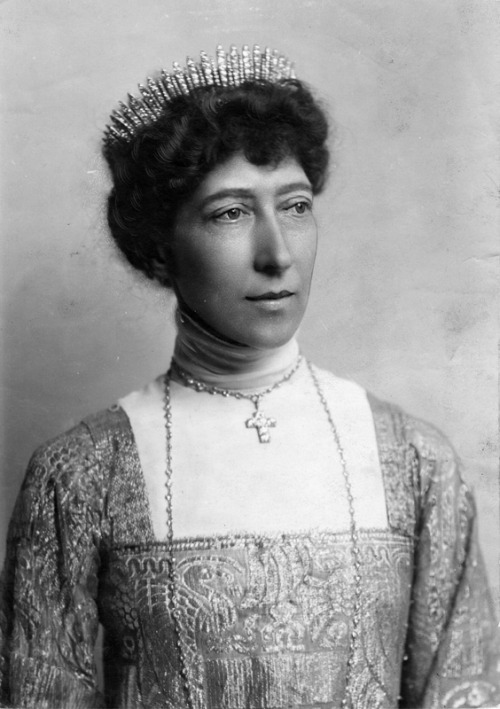 The prewedding exhibition of the gifts had been planned to take place at St. James's Palace, where they were received, until the death of Lady Feodora Gleichen there Wednesday morning, which necessitated the change. Only the smaller and more portable presents have been transferred to Buckingham Palace, but they turned the great gallery into a hall of glittering splendor. A half hour was the time limit for the visitors and this afforded them time for only a casual inspection of the wonderful display. In glass cases blazed diamonds, sapphires, and emeralds, adn there were pearls, gold and silver articles, and priceless antiques, each distinctive in design and of studied elegance. There was the three-fold gift of King George -- a tiara of diamonds and sapphires and a necklace and bracelet studded with similar stones. The monarch's gift to his daughter occupied the central position of honor in the hall. Then there was to be seen a brooch given by Queen Mary -- one great sapphire encircled by diamonds . With these and the other gems on display the princess could go through an entire court season without having to wear twice any bit of jewelry. Another case held the gift of Viscount Lascelles to his bride-to-be -- a corsage of sapphires and diamonds, from which one massive stone shone forth from the field of lesser brilliants. A cluster of diamonds is suspended from the corsage. It contains two large pearls. There also was a riviere, or necklace, of diamonds, and a diamond pendant containing two large pearl drops. This gorgeous display of jewels will be worn by Princess Mary at the wedding. Nearby was Princess Mary's gift to Viscount Lascelles. This consisted of a pair of antique souffle dishes and a platinum and gold watch chain set with pearls. The Prince of Wales's gift to his sister is a diamond and sapphire bracelet. 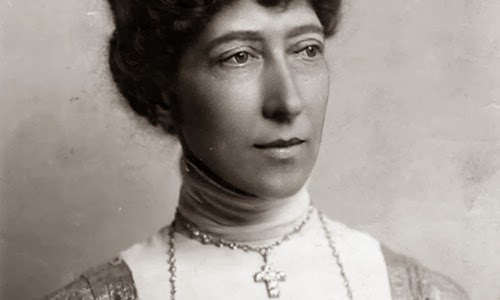 Dowager Queen Alexandra has given the princess a marvelous corsage of pearls, with emerald drops, and a beautiful necklace containing six rows of stones. 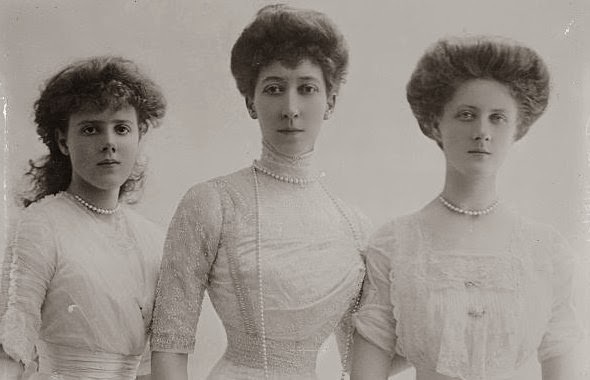 Princess Mary's aunts, the Princess Royal, Princess Victoria, and the Queen of Norway, combined in their present, sending the princess a long diamond lace brooch. The Duke of York and Princes Henry and George have given their sister a sapphire and diamond ring, unique in style and setting. From the bridegroom's parents has come a large diamond brooch. A large ring came from Queen Victoria of Spain. Queen Amelia has given the bride-elect a gold bracelet containing one huge ruby and one pearl, with a circle of diamonds as a clasp. The great-aunts of the princess and the Duke of Connaught have presented her with an ebony and gold antique clock. Another clock, perhaps the most remarkable of the lot, has been sent by Prince and Princess Christopher of Greece. It is a carriage clock with a gold sunray face, with two silver and diamond stars moving around to indicate the hours and minutes. Conspicuous among the other presents were a miscellany of rich ropes of pearls, jeweled fans, and huge silver vessels from the members of the British cabinet and others from the diplomatic corps; a handsome negligee  with a center of emeralds and a coronet of precious stones from the navy; a silver dressing table set from the army; a mink coat and muff from the twelve city companies; a diamond bracelet "from the men and women of the stage"; a negligee of rubies, pearls, turquoises, and diamonds shaped after the fashion of an eastern temple bell from Viceroy Reading of India and the Countess Reading; a splendid sable coat from twenty-eight friends; two silver cake dishes from Mrs. Whitelaw Reid, widow of the former ambassador to the Court of St. James; and an infinite variety of other gifts, consisting of furniture and wearing apparel. 1. Cropped version of a picture postcard available via Wikimedia Commons; source here. 2. Image available via Wikimedia Commons; source here. 3. Some have speculated that this was one of the Albert brooches -- one of five copies of Queen Victoria's sapphire and diamond brooch given to each of Albert and Victoria's daughters. To my knowledge, there's never been confirmation that this was indeed one of those brooches. See Suzy Menkes for more on the copies of the Albert brooch. 4. Image available via Wikimedia Commons; source here. 5. 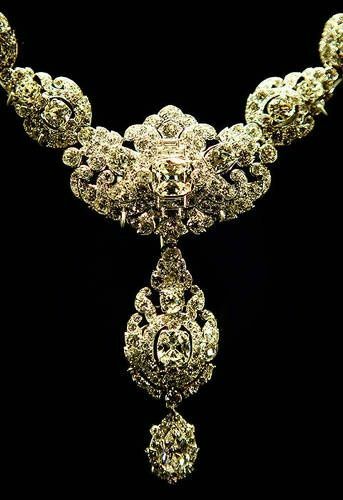 A necklace is generally referred to as a "negligee" when it includes tassels or pendant drops of irregular length; the Delhi Durbar necklace is a good example. These were especially popular during the reign of Mary's grandfather, Edward VII. The Sochi Winter Olympics came to a close yesterday evening with a ceremony honoring the best in Russian culture, so I thought it was only appropriate that my jewel book review for February should focus on one of the volumes I own that focuses on Russian royal jewels. 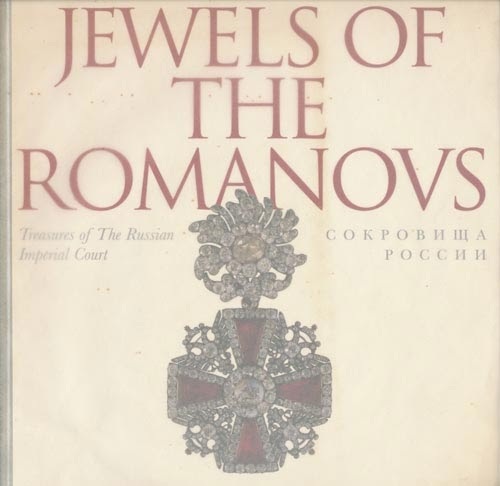 The Jewels of the Romanovs: Treasures of the Russian Imperial Court, published in 1997 to accompany a museum exhibition, is a slender book, but it highlights some unusual jeweled objects that are often overlooked in our discussions of royal jewelry. When I say that the book is slender, I mean it: it's paperback, and it only includes 72 pages of content. That said, the content is good -- clear, sharp color photographs and heavy, glossy pages. The book also features a thin piece of waxy plastic as an overlay on the front and back covers, making it slightly more durable than it otherwise might be. You'll only be able to find secondhand copies of the text at this point, as it's over a decade old, but copies can be found readily and inexpensively. It's easy to confuse this book with another tome on Russian jewels that shares an extremely similar title: Stefano Papi's Jewels of the Romanovs: Family & Court. Be warned: that second part of the title after the colon is significant! Papi's book, now in its second edition, is a much more thorough and lengthy examination of the Romanov jewel collections. In contrast, this smaller exhibition catalogue includes only pieces of jewelry held in the State Diamond Fund of the Russian Federation. Many of these jewels, along with jeweled religious objects from the Orthodox tradition and sumptuous items of clothing, were exhibited in America for the first time during the 1997 exhibition, which was held at the Corcoran Gallery of Art in Washington, D.C. The exhibit, which marked the 125th anniversary of a state visit by Grand Duke Alexei Alexandrovich to the United States in 1872, was made possible by the cooperation of American and Russian cultural organizations. Although it was not without its controversy, it provided Americans with a rare chance to view these Romanov jewels up close. For those of us not lucky enough to have attended in person, the exhibition catalogue gives us a chance to share in a small part of the experience. The book, edited by Nicholas B.A. Nicholson, begins with a helpful history of the relationship between America and Russia; the last page of the book also includes a timeline that helps to put the various Romanov tsars and tsarinas in their proper chronological context. In between, there are three major sections. The first presents a collection of jeweled ecclesiastical objects, including elaborate icons, pendants, crosses, and a truly impressive bejeweled kokoshnik headdress made for a Marian statue. These religious objects are not owned by the State Diamond Fund; they belong to the Yaroslavl State Architectural and Historical Museum-Preserve. The last section of the book features photographs of clothing worn by the Romanovs, including two truly impressive court dresses worn by Alexandra Feodorovna, the last Russian tsarina. But for our purposes, it's the middle section that is the most interesting -- it features the Romanov jewels. There are a number of intriguing pieces here, both original items and a few that have been reproduced as exact copies of jewels sold and lost after the revolution (the famous "Russian Field" tiara is an example of the latter category). My favorites include an extremely early example of a bandeau tiara, part of a diamond floral demi-parure made ca. 1760, and a stickpin from the collection of Maria Feodorovna that features a blue diamond that may have come from the same stone as the Hope Diamond. The pieces here are varied, and they're interspersed with portraits of the Romanovs in all their bejeweled splendor. So, is this one a must-have for Romanov lovers? I'm not sure. I like having it in my collection, and the photographs are wonderful; it's also relatively easy to find very inexpensive copies of the text, so it's not going to break the bank financially. However, the Alexander Palace website includes an online version of the exhibition that features much of the same content (though not all) as the exhibition catalogue. If you visit that website, and you want to see larger, more detailed images of the objects presented there, I think that you'd enjoy owning this particular book. 1. Book cover image available here. 2. Photograph available via Wikimedia Commons; source here. We're reaching back into Bernadotte history for today's jewel challenge. 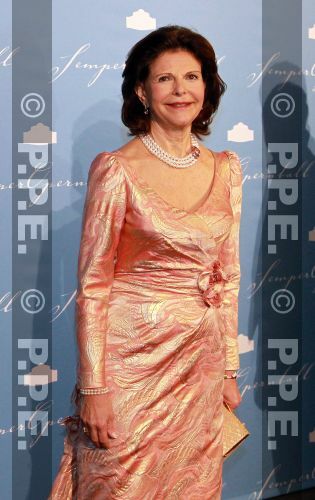 Can you identify the pieces worn here by Queen Sofia of Sweden? 1. Photograph in the public domain due to age; source here. While the Swedes are well-known for draping themselves in historic jewels, there are also new tiaras in their collection. 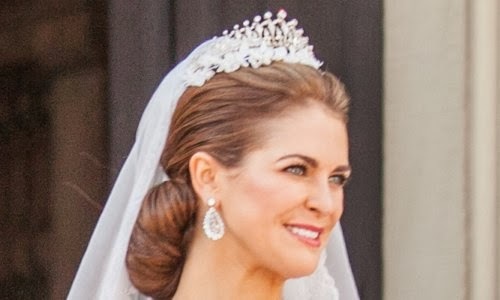 This one, the Modern Fringe Tiara, was an unexpected surprise at last year's royal wedding, which united Princess Madeleine with her financier husband, Christopher O'Neill. The piece made its first public appearance in the late 1980s. 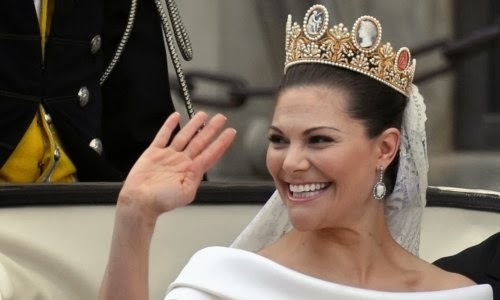 It's often said that the diamond tiara may have been a tenth-anniversary present from King Carl XVI Gustaf to Queen Silvia in 1986, but that has never been confirmed. 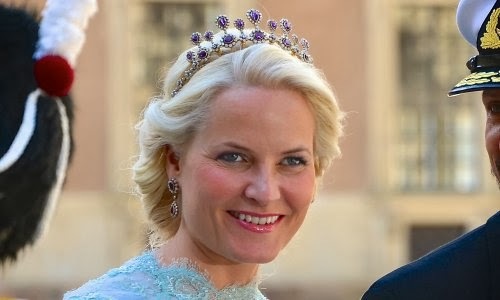 The Swedish court generally refers to the piece only as "a private tiara," making it clear that it is a personal possession, not one of the pieces in the Bernadotte jewel foundation. The sparkler is something of an innovative fringe tiara. Rather than simple vertical spikes, or slightly tapered "sunray" spikes, this tiara features geometric fringe pieces that resemble stylized fleur-de-lys elements. Each large spike also has three diamonds radiating from its peak: two smaller circular diamonds extending from each side, and one large round diamond affixed to the top of the fringe. When worn as a tiara, the piece has a rather unusual frame. It is mounted on a base that make the tiara appear to hover, halo-like, above the wearer's head. 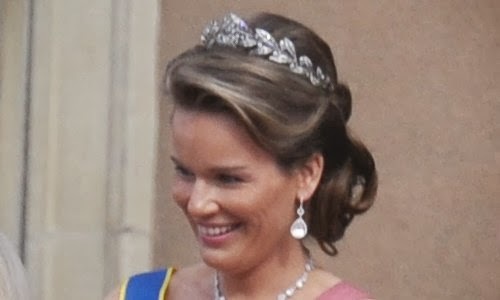 But, like many fringe tiaras, this one is convertible, and the tiara often pops up at royal occasions as a necklace (as you can see in the photograph on the left). 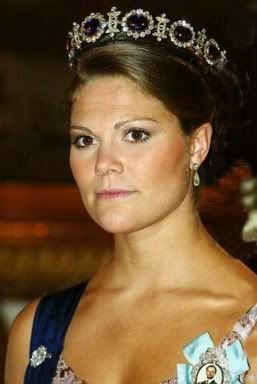 All three of the senior royal women, including Crown Princess Victoria, have worn the fringe necklace. 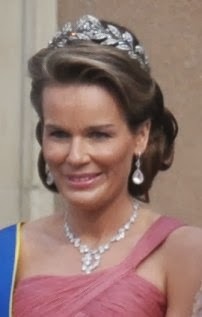 Although the tiara was first worn by Queen Silvia, in recent years it has been worn with increasing frequency by her younger daughter, Madeleine. She surprised many royal watchers by wearing this tiara at her wedding to Christopher O'Neill in June 2013. On this occasion, she covered the floating base of the tiara with orange blossoms. 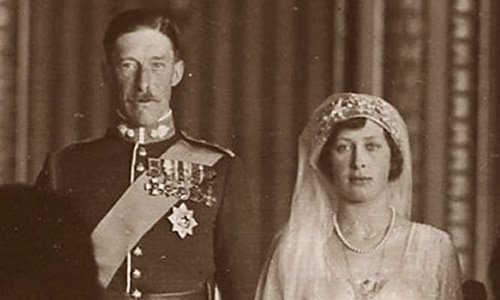 But while the Swedish royal court sometimes provides tantalizing tidbits of jewel history to coincide with major occasions like royal weddings, we sadly learned little new information about the fringe on the day -- the wedding press release from the court still described the piece only as "privately owned" . 3. You can read the press release detailing Madeleine's bridal attire here. 4. A version of this post originally appeared at A Tiara a Day in April 2013. Time once again to take a gander at ten of the most exciting stories about royal jewels from the past week! 10. Both the Dutch and Danish royal families are on ski holidays this week. Crown Princess Mary of Denmark ably demonstrated that it's possible to corral four children and one crown prince on the slopes while still wearing a shiny pair of earrings. 9. Hello! revealed this week that a pendant necklace worn by the Duchess of Cambridge was made for her by Merci Maman, a company that specializes in jewelry for mothers. The necklace features three charms: a "W" for William, a charm in the shape of a small child, and a disc engraved with Prince George's name. 8. An upcoming visit from King Carl XVI Gustaf and Queen Silvia of Sweden to the Netherlands has been announced. The royal couple will visit the Dutch royals on April 4 and 5 -- get excited to see two of the most jewel-savvy queens together! 7. Princess Caroline of Monaco chose monochromatic jewelry for a charity dinner held in Genoa, Italy, on Valentine's Day. 6. Members of the Belgian royal family attended a mass on Tuesday in honor of deceased family members, and one royal lady sported a jewel surprise. Princess Margaretha of Liechtenstein (whose mother, Grand Duchess Josephine-Charlotte of Luxembourg, was born a Belgian princess) wore a pair of modern earrings that had been previously worn by her aunt, Queen Fabiola of Belgium. Looks like Queen Mathilde is not the only royal who has been given jewel gifts from Fabiola's collection! 5. At a reception where she revealed that she keeps her BAFTA award on top of her television, Queen Elizabeth II of the United Kingdom wore pearls and the gorgeous sapphire and diamond brooch designed for Queen Victoria by Prince Albert. 4. King Philippe and Queen Mathilde of the Belgians were in Rome this week for a meeting with the Italian president; Mathilde chose simple, elegant pearl earrings to compliment her dove gray coat and hat. She wore equally simple jewelry for a visit to Germany earlier in the week. 3. For an event supporting the Art Room, the Duchess of Cambridge chose modern jewels, including Kiki McDonough earrings, a Mappin & Webb pendant necklace, and a new Cartier watch. 2. The royal who easily wins the "most bejeweled of the week" award is none other than the Prince of Wales! Charles dressed in a traditional thobe and participated in a sword dance during a visit to Saudi Arabia; befitting a prince, the hilt and sheath of the sword he wielded were plated in gold. 1. Although clear photographs of the engagement ring are sadly lacking, Prince Amedeo of Belgium and his new fiancee, Lili Rosboch von Wolkenstein, posed for official portraits on Sunday. No wedding date yet, though apparently it's being planned for later this year. Here's hoping we see Lili in a tiara on the big day! "Austria Brings Suit for Crown Jewels"
A sensational lawsuit will start shortly against the former Emperor Charles in which the Austrian government seeks to recover $20,000,000 worth of Austrian crown jewels brought to Switzerland by Charles and Count Berchtold . The trial will probably take place in Lausanne. Charles declares his property is not in Austria but in Italy and that several of the jewels were taken by Austrian troops during the invasion of Northern Italy after Caporetto . Swiss jewelers refuse to buy any crown jewels, fearing future restitution. 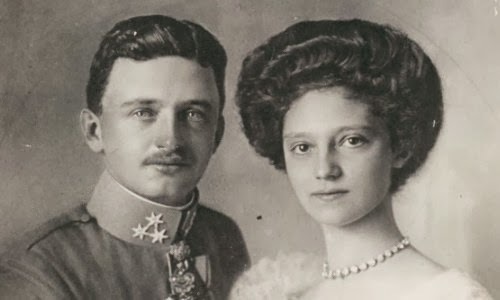 It is stated that Charles and Zita are specially anxious to sell a diamond necklace worth nearly $1,000,000 worn by the late Empress Elizabeth of Austria , who was murdered in Geneva. 2. Count Leopold Berchtold was the Imperial Foreign Minister of Austria-Hungary at the outbreak of World War I. 3. The Battle of Caporetto, on the Austro-Italian front, was fought in present-day Slovenia in October and November of 1917. 4. Empress Elisabeth, better known to us as Sisi, was most famous for the diamond star ornaments she wore in her hair. See my article on the diamond stars here. If you look at portraits of British royal women from the late-nineteenth and early-twentieth centuries, you'll often see them wearing an unfamiliar badge amid the royal family orders pinned to their left shoulders. These badges, which were worn suspended from light blue ribbons, belonged to an order of chivalry that was once widely bestowed but has since become all but extinct: the Imperial Order of the Crown of India. 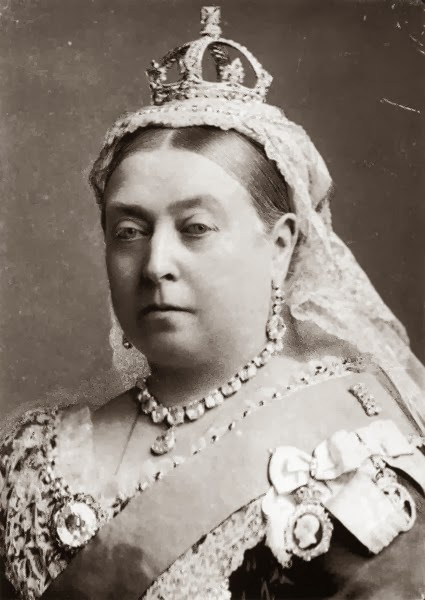 The order was begun to celebrate the elevation of Queen Victoria to her newest title, Empress of India, in 1876. From the start, this was an order of chivalry that was awarded exclusively to women -- no men were ever admitted to its ranks (although four served as its sovereign). The badge of the order, which was set with diamonds, turquoises, and pearls, included three intertwined initials: VRI, which stood for Victoria Regina Imperatrix (in English, that's Victoria Queen-Empress). 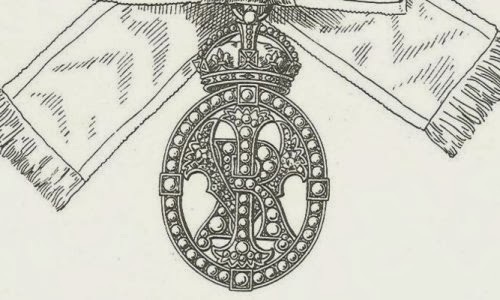 You can see the initials in the illustration of the badge above; you can also see Queen Victoria wearing the insignia of the order (partially obscured under another ribbon on her left shoulder) in the portrait at left. When Queen Victoria instituted the order on January 1, 1878, the rules of the order were established in the London Gazette . The role of the sovereign of the order was assigned to the reigning monarch of the United Kingdom (Victoria and her heirs, both male and female). She also ensured that the monarch could both invest and remove members of the order as he or she saw fit. Women who could be invested as companions of the order needed to belong to one of three categories. British princesses (who had reached the age of eighteen) were eligible. So were the wives and female relatives of Indian princes (and Indian princesses in their own right, too). The third group recognized the wives and female relatives of high-ranking British colonial officials -- specifically, the spouses and relatives of the Viceroy (or the Governor-General), the Governor of Madras, the Governor of Bombay, and the Secretary of State of India. Thirty-six women were listed as companions of the order when it was originally established. The list of companions was also published in the London Gazette, and it included women who fit into all three of the designated categories. 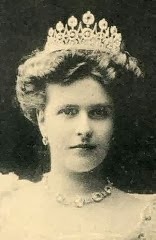 Ten British princesses were among the original members of the order, including all five of her daughters (plus Princess Louise's mother-in-law, the Duchess of Argyll), two of her daughters-in-law (the Princess of Wales and the Duchess of Edinburgh), and her Cambridge aunt and cousins (including the Duchess of Teck, mother of the future Queen Mary). Eight royal Indian women were also among the original membership of the order. Maharani Bamba, something of a real-life Cinderella, was the wife of the last Maharaja of Lahore. Nawab Shahjihan Begum was the ruler of Bhopal in her own right; her elderly grandmother, Nawab Kudsia Begum, was also made a companion. Maharani Vani Vilasa Sannidhana Kempananja Ammani Avaru was the wife of one Maharaja of Mysore and the mother (and regent) of another. Maharini Jamnabai Sahib Gaekwad, the widow of the Maharaja of Baroda, was also the adopted mother of a subsequent Baroda ruler. Sahebzadi Dialwar unisa Begum Saheba was the grandmother of the Nizam of Hyderabad. Vijaya Mohenu Mukta Boyi was the daughter of the last Raja of Tanjore, and some recognized her as her father's successor. 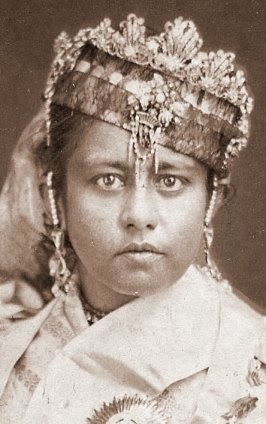 Maharani Swarnamoyee of Cossimbazar was renowned for her charity work. Seventeen additional women, all related to the past and present colonial officials in India, were also recognized as original companions of the order. The Dowager Countess of Elgin, Lady Mayo, Lady Susan Bourke, Lady Jane Baring, Lady Lytton, Lady Lawrence, and Lady Strachey were all wives, widows, or daughters of Viceroys and Governors-General of India. Lady Mary Temple-Nugent-Brydges-Chandos-Grenville, Lady Hobart, Lady Napier, and Lady Denison were all wives or daughters of Governors of Madras. Lady Frere and Lady Temple were wives of Governors of Bombay. Viscountess Halifax's husband was in charge of the British East India Company. Lady Salisbury, Lady Ripon, and Lady Northcote were wives of Secretaries of State and (Under-Secretaries of State) of India. Over the next seventy years, many more British princesses, Indian royals, and relatives of colonial officials were added to the order's ranks. In 1947, when British colonial control of India ended, the order was essentially suspended; as you can imagine, there's been no need to add new companions to an imperial order of chivalry based in a country that has since gained its independence. 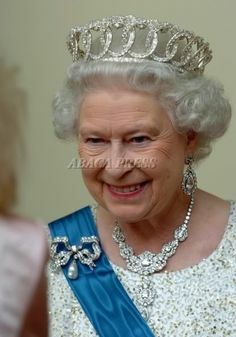 Today, there is exactly one living person who was invested as a member of the order during its tenure: Queen Elizabeth II, who was made a companion on June 12, 1947. Her sister, Princess Margaret, was made a companion of the order on the same day, even though she was only sixteen. (You can see Margaret wearing the insignia of the order in this portrait; it is placed on her left shoulder, above her family orders.) Both of the princesses were appointed to the order during the celebrations of the official birthday of their father, King George VI . India gained independence from Britain two months later, on August 15, 1947. 3. The relevant pages from the London Gazette are available here. 5. See the London Gazette announcement here. The socialist journals of Germany have seized upon the descriptions of the jewels worn by the empress at the court festivities just ended to criticise the extravagance revealed by the "mother of the nation." It is said that at important court balls and banquets the empress wore jewels valued at $1,750,000. They included a huge diamond tiara, a necklace of pearls and diamonds, several diamond bracelets, many diamond rings, and a diamond chain around her waist. Even the train of her majesty's dress was decked with wonderful precious stones, and a few superfluous jewels were affixed to the imperial fan. During the court function two pages watched incessantly to make sure none of the gems were lost. Most of the jewelry is the property of the Prussian crown, and descends from empress to empress. The empress's own jewelry is worth less than that of many middle-class ladies. At the conclusion of each court festivity the crown jewels are replaced in fireproof safes and guarded day and night by military sentinels. No one but the ladies in waiting is allowed to remove the jewels from the empress. Four court ladies attend to this work and sign a statement witnessing the safe return of the valuables to the safes. The greatest formalities are always observed. 1. Detail of Philip de László's Portrait of Auguste Viktoria, Deutsche Kaiserin (1908); source here. The original painting hangs in the dining room at Huis Doorn, the Dutch manor house where the kaiser and kaiserin lived in exile after World War I. The house is now a museum. 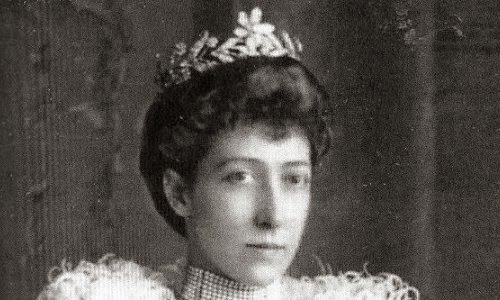 So far this month, we've looked at two of the grandest wedding gifts received by Princess Louise, the eldest daughter of King Edward VII and Queen Alexandra of the United Kingdom, on her marriage to the Duke of Fife: the diamond tiara given to her by the groom, and the diamond fringe given to her by her parents. Today, let's have a look at a smaller token that was among her wedding presents: her diamond cross pendant. Ursula's run-down of Louise's wedding gifts, which is based on contemporary news reports, describes the piece as "a splendid cross, composed of large rose-cut brilliants, which measures in an inch and a half in length" . The cross was not a present from one of her relatives or a specific member of the British aristocracy; instead, it was a gift from "the gentlemen of Norfolk" . The generosity of the people of Norfolk toward Louise is surely connected with the royal family's estate in Norfolk, Sandringham House. The estate was the home of Edward VII and Alexandra, who were still the Prince and Princess of Wales when Louise married in 1889. Queen Victoria had purchased the estate for the Waleses at the time of their marriage in the early 1860s, and Louise and her siblings spent much of their childhood there. It's still an important retreat for the Windsors, and it's one of the only properties that belongs to the family in their own right rather than to the Crown. 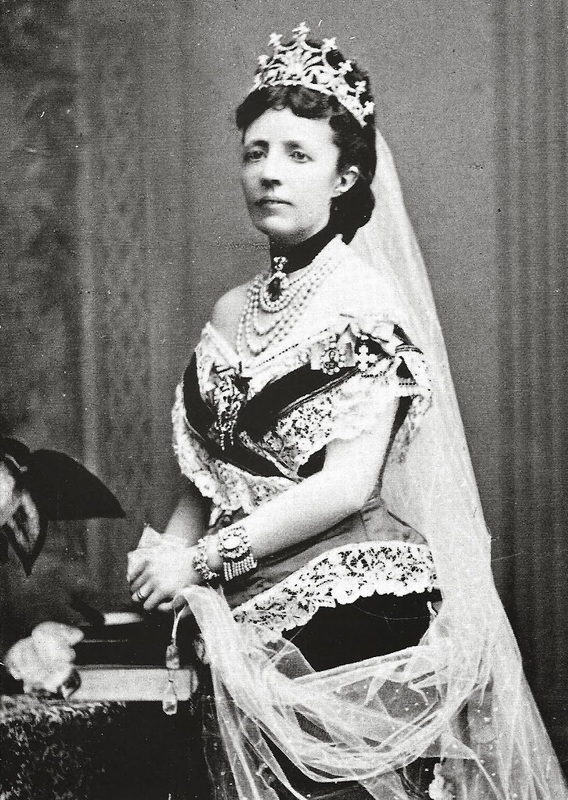 Like many of the smaller pieces of jewelry owned by Princess Louise, this diamond cross seems to have disappeared into the proverbial royal mists. But based on the approximate date of a portrait (excerpted at the top of this post) in which she wears it, we know that it didn't meet the sad fate that some of her jewels did. In 1911, Louise was sailing to Egypt with her husband and their two daughters, Alexandra and Maud, when their ship, the Dehli, wrecked off the coast of Morocco. Although all of the family were rescued, there were two sad consequences for the Fifes. For one, a case of Louise's jewels was washed away and was never recovered; it's never been made clear which pieces were lost, but if an item was not photographed on the princess after December 1911 (as the diamond cross was), it's possible that it was among the lost cache . Even sadder, though, were the effects of the wreck on the health of Louise's husband. The Duke of Fife developed pleurisy shortly afterward and died in Egypt. 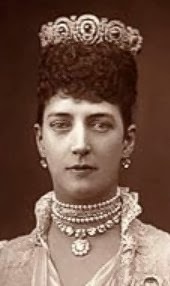 Princess Alexandra, who inherited much of her mother's jewelry, became Duchess of Fife in her own right following her father's death. Who knows -- perhaps the Norfolk cross was among the pieces she received from Louise? We may never know. Small jewels like this, especially those that don't hold a great deal of sentimental value, are extremely easy to auction off quietly. The cross may be hiding away in the Fife family's collection, or it may have parted ways with them long ago. 1. Cropped version of photographic portrait available here. 2. See Ursula's website for much more information on Louise's gifts. 3. See the article syndicated in the West Coast Times. 5. See this article from the Auckland Star. Time for another case for the jewel detectives! Can you identify the pieces worn here by Queen Ena of Spain? Most of the senior royal ladies in Europe have multiple tiaras at their disposal, some of them personally owned, some of them loaners from the royal vaults. 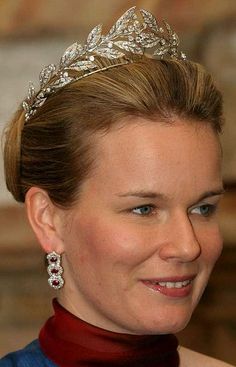 Up until her husband's accession to the throne last year, however, Queen Mathilde of the Belgians had only ever worn two tiaras in public: the diamond bandeau owned by her mother-in-law, Queen Paola, and this one, her diamond laurel wreath tiara. 2. Cropped version of a photograph available via Wikimedia Commons; source here. From the oldest crown in the world to a glittering surprise in Britain, here are the top ten news stories about royal jewels this week! 10. If you're in the New York area, get ready: the oldest crown in the world will be on display in your city starting today. It's from Israel, is six thousand years old, is made of iron, and includes vultures in its design -- not sure at all why that royal jewel trend didn't last. 9. They may not be vultures, but the Duchess of Cornwall wore a pair of turquoise, diamond, and gold bird brooches to visit a radio station on Tuesday. 8. 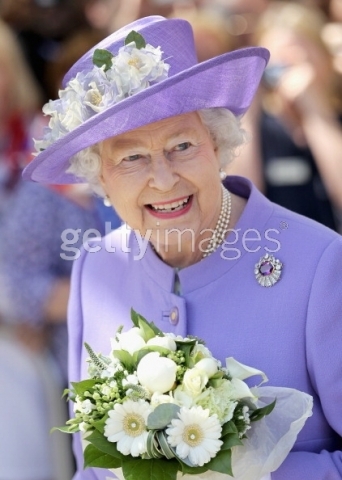 After spending her accession day at Sandringham (an annual tradition), Queen Elizabeth II returned to London. For the train journey from King's Lynn, she paired her usual pearls with the Grima Ruby Brooch. 7. After several days spent cheering on the Dutch speed skaters in Sochi, Queen Maxima wore sentimental jewelry at the Centre for Healthy Weight in Rotterdam, including two bracelets that incorporate the names and initials of her husband and her three daughters. 6. At an engagement in Amsterdam on Thursday, Maxima chose slightly more theatrical jewels: a pair of large, dangling blue earrings. 5. 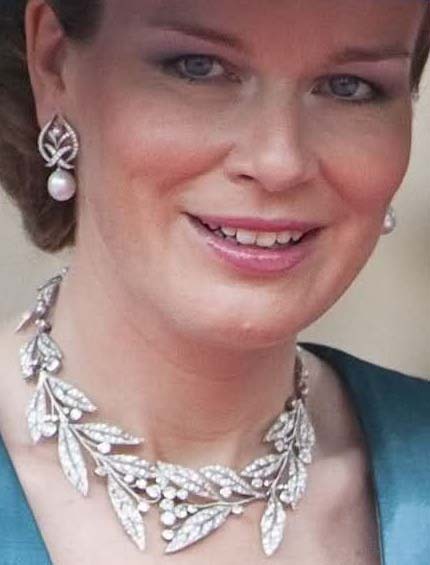 Following their series on the auctioned jewelry from the collection of the late Grand Duchess Josephine-Charlotte of Luxembourg, the bloggers at Luxarazzi highlight one of the pieces that was kept by the family: Queen Astrid's diamond and emerald choker. 4. The Countess of Wessex wore a delicate pendant necklace and drop earrings for a visit to Dorchester Abbey on Thursday. 3. Crown Princess Mette-Marit of Norway honored sustainable fashion designers this week in Oslo; she chose an appropriately fashionable cocktail ring for the event. 2. Queen Silvia of Sweden chose a pearl necklace and bracelet for the annual SemperOpernball at the Opera House in Dresden on Friday. The necklace incorporates a dusky orange stone in its clasp, possibly a topaz -- there's speculation that the set is new. 1. And finally, the top spot this week is reserved for a big jewel surprise: the Duchess of Cambridge borrowing the Queen's Nizam of Hyderabad necklace for a gala at the National Portrait Gallery. Way to break out the serious bling, Kate! With Valentine's Day coming up at the end of this week, people around the world are turning their thoughts toward romance. What better way could their be to celebrate a holiday about love than by looking at some of the most romantic pieces of jewelry in royal collections? 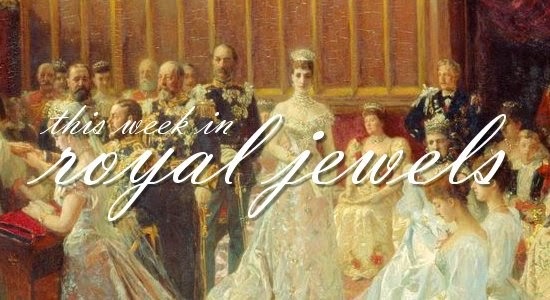 Here are five of my favorite romantic royal jewels -- please feel free to nominate more Valentine-worthy jewels in the comments! The Bernadottes of Sweden have some serious royal jewelry in their vaults, but one of their most prized sets is the cameo parure. 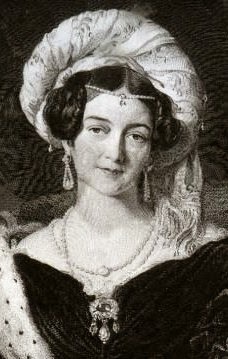 According to De Kongelige Juveler, a Danish documentary about royal jewels, the cameo set was made by Marie-Étienne Nitot for the first wife of Napoleon Bonaparte, Joséphine de Beauharnais, in 1809 . The first royal woman to be depicted wearing the parure in a portrait was Joséphine's daughter, Hortense, who was briefly the Queen of Holland. It made its way into Swedish hands via Hortense's niece, Joséphine of Leuchtenberg. The piece is especially romantic because of the designs depicted on the tiara's cameos: scenes from the myth of Cupid and Psyche, in which a mortal woman and the god of love must overcome numerous obstacles before they can finally be married. It's also gained a romantic aura because of its use as an important Bernadotte family wedding tiara. Queen Silvia and her elder daughter, Crown Princess Victoria, are among the royal women who have been married in the cameos. 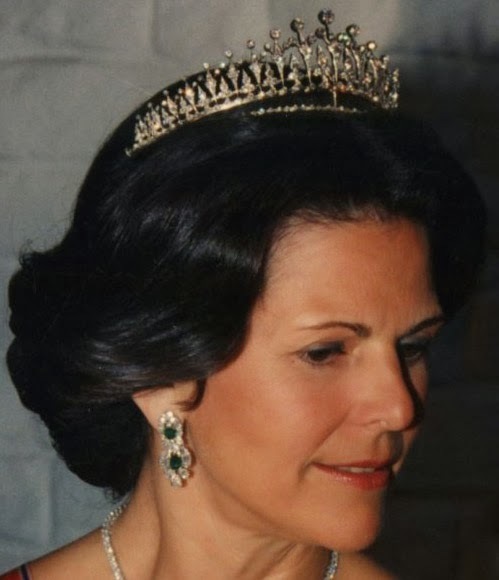 Queen Silvia remarked in the jewel documentary that she focused on two things during Victoria's walk down the aisle: "the beauty of the tiara and her happiness." Engagement rings are inherently romantic pieces of jewelry, and there are numerous famous royal examples. But for me, one of the most lovely is the diamond ring given by Lieutenant Philip Mountbatten (born Prince Philip of Greece and Denmark) to Princess Elizabeth of the United Kingdom. It's not an especially unusual design: the ring consists of a three-carat diamond set in platinum and surrounded by five additional diamonds. 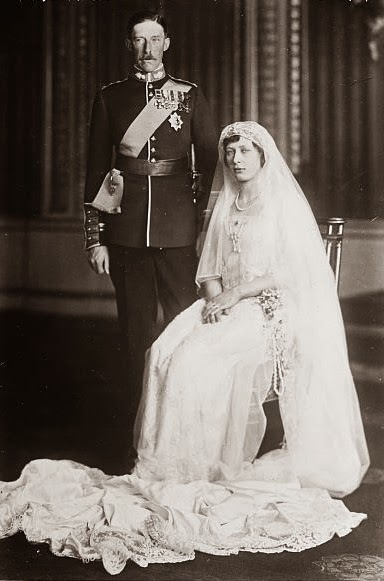 But beyond the classic, elegant setting of the ring, and its status as a romantic gesture, the gems themselves have special significance: they were taken from a tiara once worn by Philip's mother, Princess Alice of Battenberg. She gave the tiara to her son, who helped design the engagement ring using his mother's diamonds. Prince Philip had a difficult childhood to say the least, and it's a lovely tribute to his mother to have her diamonds used for his wife's ring. And clearly it was a good start to a marriage -- the couple have been married for 66 years and have four children, eight grandchildren, and four great-grandchildren. Made by Cartier, this lovely diamond and platinum scroll tiara was one of the many wedding gifts given in 1905 to Princess Margaret of Connaught on her marriage to Prince Gustaf Adolf of Sweden. It's not the most elaborate of the gifts she received, but it is one of the most romantic, largely because of the identity of the giver. Margaret and Gustaf Adolf had met, fallen in love, and become engaged in Cairo; he'd been singled out as a marriage prospect for Margaret's sister, Patricia, but he fell in love with Margaret instead. 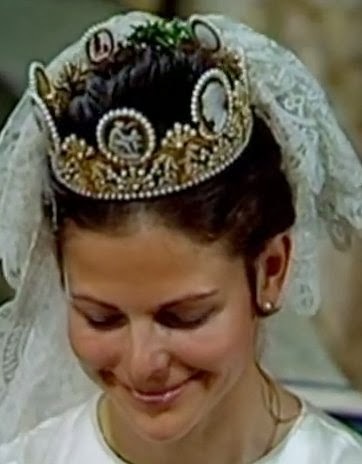 The tiara was a gift from Abbas II, the last Khedive of Egypt and Sudan; the gift therefore commemorated the couple's first meeting and their wedding. We've talked quite a bit about Margaret's tragic story on the blog; her early death was one of the reasons that her daughter, Queen Ingrid of Denmark, took extra care to remember her mother by wearing her jewelry. 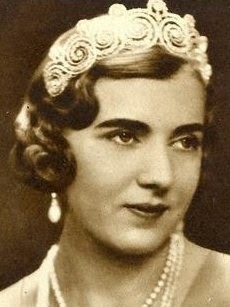 The Khedive tiara has become the official wedding tiara of all of Ingrid's female descendants, crowning Danish, German, and Greek brides at their royal weddings. Nicholas II of Russia had to propose several times to Princess Alix of Hesse before she agreed to marry him, so it's perhaps not surprising that once she said yes, he showered her with jewels. One of the most lovely of these tokens is an enormous aquamarine and diamond brooch, which he gave to her in August 1894. The brooch was purchased in St. Petersburg from Fabergé, and the beautiful aquamarine that dominates the piece was mined in Siberia. I've never seen an image of Alix wearing the brooch, but it's a rare piece of her jewelry that still exists today. It was acquired by Wartski of London, a firm that specializes in Fabergé; they apparently didn't know about its Romanov origins until they did additional research. Geoffrey Munn (he of the famous tiara tome), the managing director at Wartski, describes the provenance of the romantic engagement piece as "sort of stratospheric." You can see a photograph of the brooch here. Our final romantic royal jewel story is a bit less conventional. The Cambridge emeralds weren't worn at a wedding or given as an engagement present; instead, they were a gift from a prince to the mistress he loved. The deep green stones were won in a lottery by the Duchess of Cambridge. She gave them to her daughter, Princess Mary Adelaide, Duchess of Teck -- better known to us as the mother of Queen Mary. 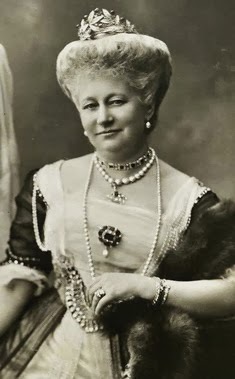 But May didn't inherit the emeralds from her mother; instead, when Mary Adelaide's children divided her estate, the emeralds went to Prince Francis of Teck, one of Queen Mary's younger brothers. Francis never married, but he was apparently very in love with his mistress, the Countess of Kilmorey (who was also reportedly one of the mistresses of King Edward VII). When Frank died in 1910, he left Nellie Kilmorey all of the jewels he'd inherited from his mother, including the family emeralds, much to the shock and dismay of his sister . She was preparing for her coronation, and she wanted the Cambridge emeralds back. In the end, she had to purchase them from Lady Kilmorey; for good measure, she also had Frank's will sealed to avoid public scandal. Shortly afterward, the emeralds were incorporated into the Delhi Durbar parure, worn by Mary at the coronation celebration in India in 1911 . You'll also see the some of the Cambridge emeralds, once gifted to a royal mistress, worn with the Vladimir tiara today by the current queen. 2. At the time of this posting, the documentary is available on YouTube. 3. Cropped still from a YouTube video; source here. 4. Detail of a picture postcard in the public domain; source here. 5. Cropped version of a photograph available via Wikimedia Commons; source here. 6. 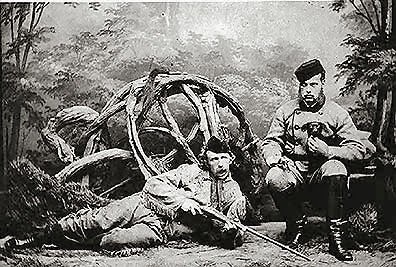 Cropped version of a photograph available via the Royal Collection; source here. 7. Read more of the brooch's story, as told by Munn, here; additional information on the piece is also available at Ursula's site. 8. The Telegraph has more on Frank Teck's will, including its legacy for royal wills that followed. 9. Cropped version of a photograph in the public domain; source here. 10. See Roberts, The Queen's Diamonds, pp. 174-77. Those who have been hoping that the rumors that the Duchess of Cambridge has been granted wider access to royal heirloom jewels were true were surely quite happy yesterday. Kate attended a black-tie reception at the National Portrait Gallery in London wearing a Jenny Packham dress and a platinum and diamond necklace from the Queen's personal collection. The necklace in question was a wedding gift to the then-Princess Elizabeth from the Nizam of Hyderabad in 1947. 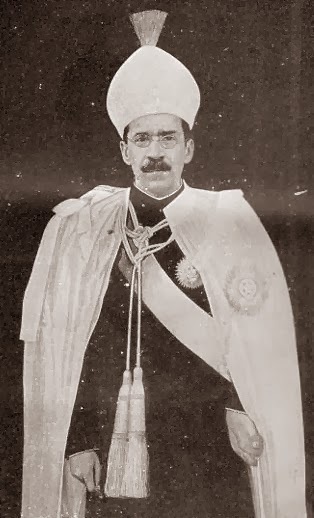 Asaf Jah VII was the ruler (or Nizam) of Hyderabad, which is located in the south-central part of the sub-continent of India (which was then under British colonial rule). He was one of the richest men in the world, so he could afford to give the princess a truly spectacular wedding gift. He followed through by fulfilling most jewel-lovers' greatest dream: he left instructions with Cartier to let the princess pick anything from their existing stock for her present. When you think about it, it was really like giving her one of the best gift cards of all time. 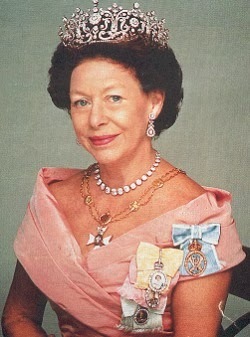 Princess Elizabeth chose two pieces: a floral tiara, which included removable elements that could be worn as brooches, and a coordinating floral necklace. Both pieces were made of diamonds set in platinum. The necklace, which was made by Cartier in 1935, is especially intricate, featuring more geometric diamonds nestled in the abstract floral design. Hugh Roberts describes it as follows: "The pavé-set centre with detachable double-drop pendant incorporating 13 emerald-cut diamonds and a pear-shaped drop; the chain of 38 brilliant-cut open-back collets with an elongated oval brilliant-set snap" . The piece had actually been previously owned; it had been sold in 1936, and then reacquired by Cartier from the buyer the following year. The first incarnation the necklace included several additional pendant sections, which were removed by the jeweler before Elizabeth acquired it . 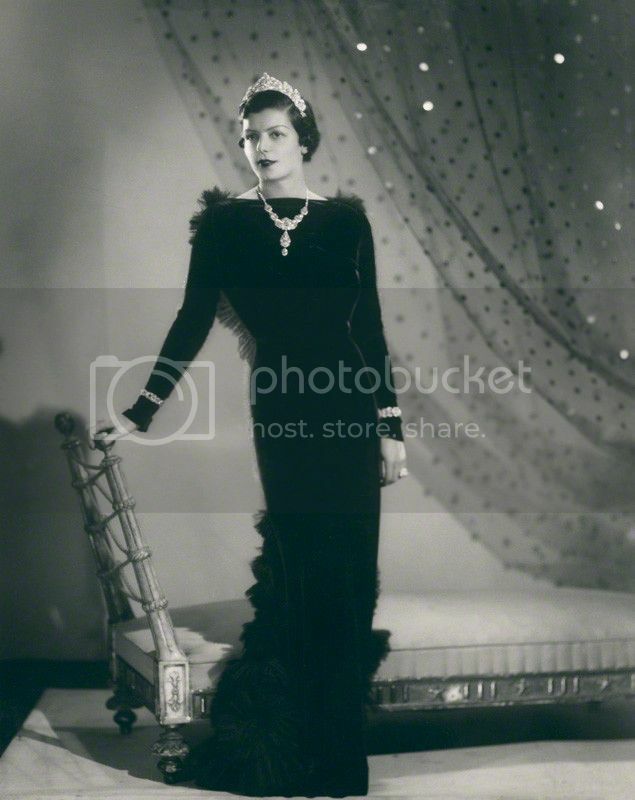 In the period before it was selected by Elizabeth, it was also photographed on Elfrida Greville, Countess of Warwick, who was married to the 6th Earl of Warwick. Elizabeth wore both of the pieces frequently during the early years of her marriage. 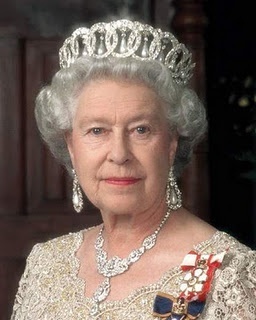 She posed in the necklace for one of the last series of portraits taken of her before she succeeded to the throne. The photographs were taken by Yousuf Karsh in 1951, and two of the images are now in the collection of the National Portrait Gallery. 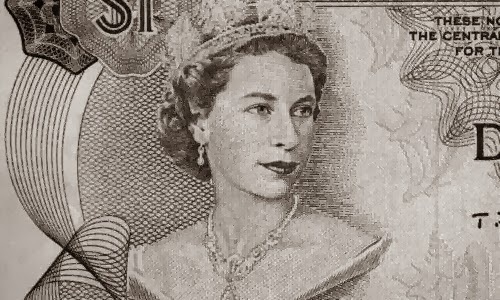 Another early portrait of the Queen, in which she wears the Nizam necklace with the George IV State Diadem, has been reworked for use on various pieces of currency (including the image above). 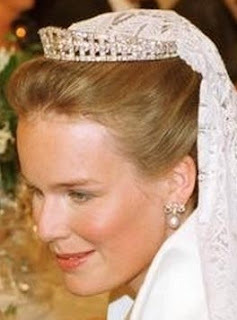 In 1973, Elizabeth had the Nizam tiara dismantled. She kept the three floral brooches from the piece intact, but had the diamonds repurposed. They were combined with a cache of 96 Burmese rubies, which had also been a wedding gift, to make a new tiara, the Burmese Ruby. The necklace was not significantly altered. It remains today largely the same as it was when she selected it from Cartier, although she has shortened the chain, removing eight collets. 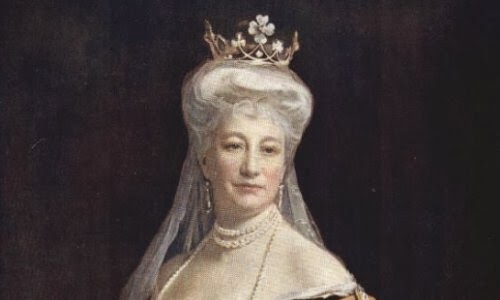 She still wears the necklace on occasion, often pairing it with other impressive jewels, including the pearl and widowed versions of the Vladimir Tiara. It's a real treat to see the younger generation of the Windsors begin to wear some of the impressive pieces that belong to Elizabeth II. Here's hoping this is just the first of many jewelry surprises from Kate! 1. 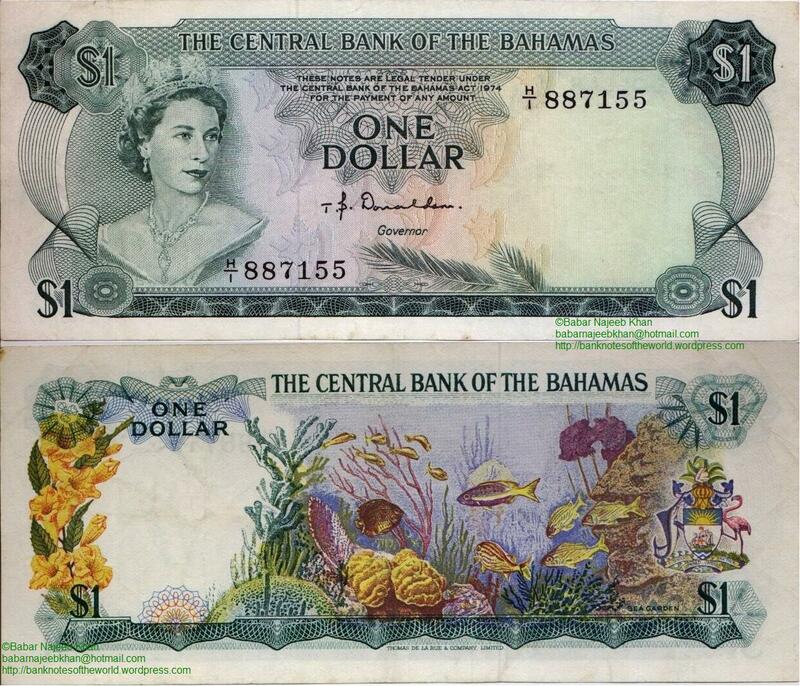 Cropped version of an image of the Bahamian dollar from the 1970s; source here. 2. Cropped version of a picture postcard available via Wikimedia Commons; source here. 3. See Roberts, The Queen's Diamonds, pp. 282-85. 4. 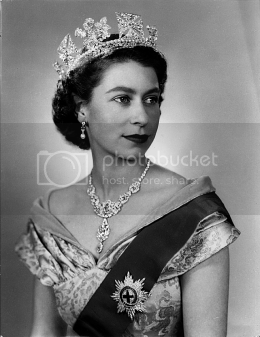 A photograph of the original version of the necklace is available on p. 282 of The Queen's Diamonds.